On 31st July 2018, Elementos announced that binding Heads of Agreement had been signed with Eurotin Limited (TSX-V: TIN) (“Eurotin”) to advance the acquisition of the Oropesa Tin Project in Andalucia, Spain. More recently on the 22nd October 2018, we announced our entering of an Arrangement Agreement to acquire Oropesa Tin Project. This agreement has now been FULLY EXECUTED. This project is one of three currently under progress for Elementos Limited. A Feasibility Study is underway and a Mining License application has been lodged. This project boasts open pit potential with an uncomplicated geology that can be dealt with using a conventional process flowsheet. 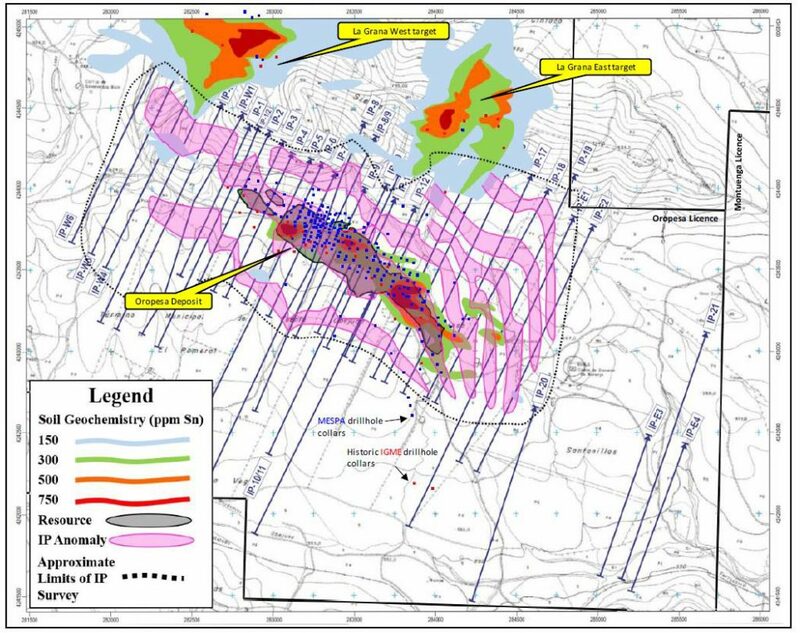 JORC Measured and Indicated Resource of 9.34mt @ 0.55% tin, and JORC Inferred Resource of 3.2mt @ 0.52 % tin (at 0.15% tin cut-off); for a total contained JORC Resource of 67,520 tonnes of tin. Elementos Limited believes the acquisition of Oropesa represents an excellent opportunity to create value-uplift potential for shareholders as the project is advanced towards development. • Local community support – The local government and community is extremely supportive of the project moving ahead. • Final engineering and design, prior to construction, commissioning and operations. Elementos believes there is potential to identify other resources in the tenement package and expand the scale of the project in the future. Oropesa consists of a 14.51 square kilometre concession package located approximately 75 kilometres north-west of Cordoba and 180 kilometres north-east of Seville, in the region of Andalucia, in southern Spain. The Oropesa district has historically been a mining district for base metals with coal mining ceasing in recent times. Tin mineralisation was first recognised at Oropesa in 1982. Intensive exploration activity since 2010, including 261 drill holes, has resulted in the definition of the current mineral resource. The project area contains numerous geophysical and geochemically anomalous regions that could potentially extend this resource with additional exploration. Access to the Oropesa project area is well serviced with paved highways and gravel roads and tracks throughout the area. There is rail access approximately 16 kilometres from the project area. The district also has a number of power transmission lines of varying voltage capacities. 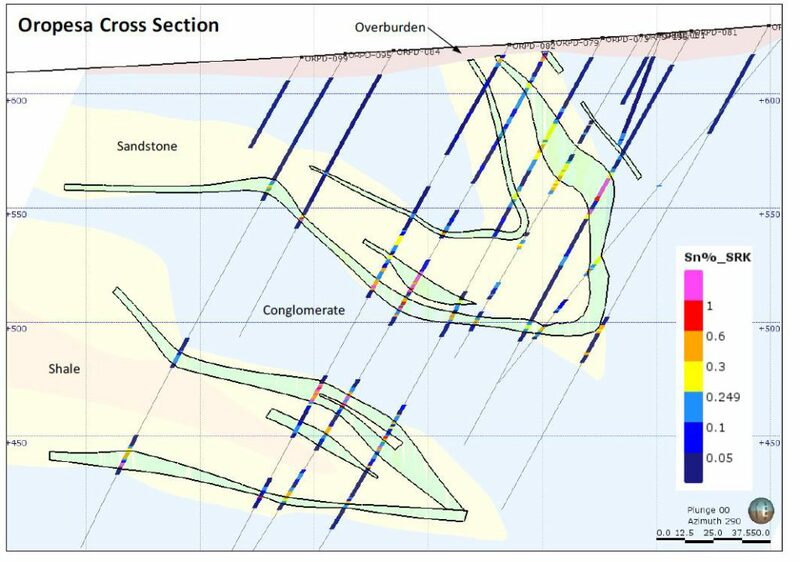 The tin mineralisation (cassiterite with minor stannite) occurs as a replacement style orebody associated with sulphides, predominantly pyrite and pyrrhotite within a sedimentary sequence at the contact between sandstone and conglomerate units. Widespread folding of the sedimentary sequence has resulted in the mineralised sequence being overturned and repeated in places. The Oropesa tin project contains a JORC compliant Measured, Indicated and Inferred Resource of 67,520 tonnes of tin (see Table 1). The Project has been subject to extensive metallurgical testing including bulk sample analysis. Metallurgical testing has defined a conventional tin recovery processing circuit consisting of gravity and flotation that has achieved tin recoveries of 74.2% to a concentrate grade of 62.4% tin. Our team will be studying opportunities to optimise the flowsheet including using ore sorters which has been successfully demonstrated at other tin projects around the world. An Exploitation Licence (Mining Licence) application was lodged with the Junta de Andalucia in October 2017. The application entails all technical aspects for the mining and processing of the Oropesa orebody as well as associated infrastructure, equipment and tailings storage facilities to operate the tin mine. The application is for an initial open-cut operation graduating to an underground operation with the potential to produce up to 3,000tpa of tin in concentrate. The Environmental Impact Assessment was lodged with the Government in January 2018.